Haflong : Movement of the polling officials for the far flung 8 (eight) polling stations began today for 16 Haflong (ST) of 3 Autonomous District Lok Sabha elections on 18th April, 2019. Meanwhile the Deputy Commissioner Amitabh Rajkhowa offered his best wishes to the 1st polling party before leaving Haflong for their destination and hoped that this time voting percentage would increase remarkably. 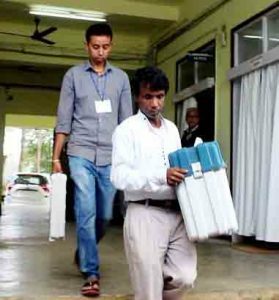 It is to be noted that a phase wise training have been imparted to all the officials engaged as polling officials in 242 polling stations around the district. Any kind of laxity especially regarding intake of intoxicant by the engaged officials during their designated duty will not be tolerated by the authority. One such case brought to the notice of the authority was dealt with strict action on the official today. Assam BJP Confident Of Winning..
Ministry of Home Affairs Denies..